Special Savings Special Needs: Artichokes, parades, and Matryoshka...or being the littlest nesting doll. sure there is a smaller doll that would stand below us. Doesn't change our journey and our struggles and doesn't really encourage the other party. (Have you ever wondered just who it is that ends up defined as that last little doll?) I suppose it is to spur us on to help someone else worse off. How about we just help one another. Whoever shows up in our real world, where ever we are on our journey, and where ever we fall in the line up of nested dolls! Ironically Jesus had a whole upside down/backwards view of the nested doll theory. I have always heard of it described as the upside-down kingdom. Unfortunately we are not a very patient people by nature. It would be better to us to be that middle doll, or even the second to last doll, right now than to wait to be at the top of the line later. 28-30Jesus replied, "Yes, you have followed me. In the re-creation of the world, when the Son of Man will rule gloriously, you who have followed me will also rule, starting with the twelve tribes of Israel. And not only you, but anyone who sacrifices home, family, fields—whatever—because of me will get it all back a hundred times over, not to mention the considerable bonus of eternal life. This is the Great Reversal: many of the first ending up last, and the last first." When Alyssa was in elementary school I became concerned that certain areas in school were disproportionately difficult for her. While she was filling up notebooks with stories she concocted that actually kept me reading to see how they turned out, she avoided reading books like they were torture. She misspelled certain words over and over again. And the mad minutes for math facts, forget about it! I felt ridiculous pressing for extra help, she was getting all A's while I had little ones at home with disabilities and yet undiagnosed learning disabilities who were sure to struggle through all aspects of education. Finally I called the reading specialist that I was connected to from my own days of teaching, and poured out my feelings. I was unsettled by my daughter's struggles. She did not feel lucky by comparing struggles to others. It didn't really matter if she was at the middle of the line up of nested dolls. When she was frustrated she felt awful and so did I. That woman was very wise. She assured me that she did need some extra time to work through her learning issues, eventually we gave her the label of suspected dyslexia, because your struggles on your journey are your very real frustrations. If the kid in the seat next to you is struggling it doesn't negate the fact that you need help too. We parents of special needs kids should probably keep that in mind for the rest of our clan more often. Mrs. Horaho's help was a godsend and gave Alyssa the tools she needed to work through some of her difficulties, and the validation of her own frustrations. So I once again go back to the fact that I cannot control many situations, but what I can control is my reactions to them. While I may not need to seek out people to label as worse off than myself at this temporary stage of my life's journey, others may indeed label me as being less fortunate. It reminds me of something Joni Erikson Tada said at a ladies' group she held one afternoon at Family Retreat. She said something along the line that perhaps the truly disabled persons are those who do not even recognize their own shortcomings and struggles and their need to rely on God. Enough said. 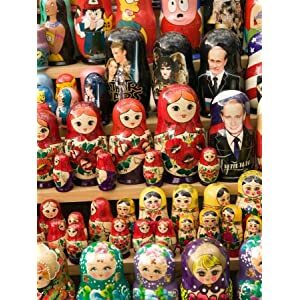 I think from now on, when I find myself functioning as a parade for onlookers I will just utter the word Matryoshka. Try it...it kinda rolls off with just the right attitude. It is another word for nesting dolls. Only I will picture my family all nested up, inside the one who can heal and love us all.